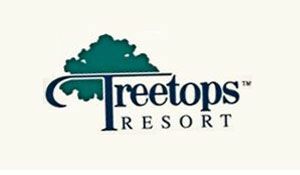 The Treetops Sylvan Resort houses Gaylord restaurants. The- Sports Bar–pizza, appetizers and 60 different beers. Lunch, Dinner, Bar * $-$$ Legends on the Hill–Steaks, pasta, seafood. Breakfast, Dinner. Hunter’s Grille–tapas, ‘tinis and wine bar, Fri. & Sat evenings. Bar * $-$$$. Here is the link where you will find hours and menus.